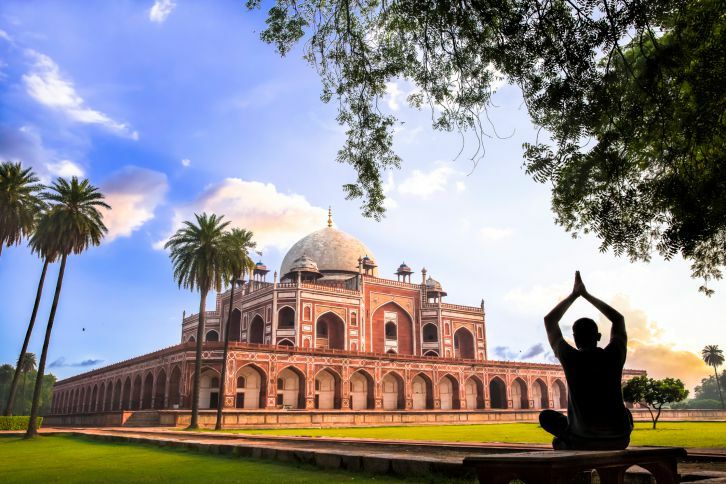 Yoga at Humayun’s Tomb, Delhi, India. SoumenNath/Getty Images. One of the more pervasive assumptions about yoga is that it is very old. When we begin to practice yoga asanas, we are often encouraged to believe that the shapes our bodies are taking are part of an ancient tradition, the same postures having been assumed by initiates over the course of centuries. But while there has been something called "yoga" for a long time, it bears almost no resemblance to what we now mean by the word. Just how old are most of the postures that we encounter in a modern yoga class? As it turns out, probably not so very old. There are several texts that are referenced over and over as the philosophical basis for the physical side of yoga, but little mention of yoga postures is made in them. In the Bhagavad Gita, for instance, the word asana is used to mean seat. Likewise, in the Yoga Sutras of Patanjali, asana, one of yoga's eight limbs, refers to a steady and comfortable sitting posture for meditation, according to yoga scholar Mark Singleton, author of Yoga Body: The Origins of Modern Posture Practice (2010), in which he explores the evolution of yoga into the mainstream. Another ancient source, the Hatha Yoga Pradipika, "describes fourteen postures, eleven of which are seated postures. It recommends four of them above all others (siddha, padma, simha and bhadra): these are all seated meditation postures," says Singleton. So if not described in ancient texts, where did yoga poses come from? Singleton's research concludes that yoga asana as we know it today came into being in comparatively recent history, through a confluence of factors including the international physical culture movement of the 19th century, which ushered in many new techniques and emphasized the morality of fitness, the influence of colonial British gymnastic conditioning (particularly on standing poses) in India, and the rise of post-colonial Indian nationalism, which sought to identify and promote an indigenous form of exercise. Singleton's narrative reinforces the powerful influence of T. Krishnamacharya on modern postural yoga. Krishnamacharya's teaching, made possible by the patronage of the Maharaja Krishnaraja Wodeyar of Mysore, flourished in the 1930s and 40s at the Mysore Palace as part of the education of young boys, mostly of the elite class. N.E. Sjoman's 1996 study, The Yoga Tradition of the Mysore Palace, offers an in-depth look at the set of circumstances that allowed Krisnamacharya's style of yoga to evolve and promulgate, particularly through his influential students B.K.S. Iyengar and K. Pattabhi Jois. Sjoman, a Sanskrit scholar who lived in India for many years, including five years in Pune during which time he studied with Iyengar, was allowed by the Wodeyar family to publish a section of a manuscript from the Mysore palace entitled Sritattvanidhi. Created sometime between 1811 and 1868, this manuscript depicts and names 121 asanas. Many are recognizable as postures we practice today, though most under different names. Sjoman points out the influence of the training methods used by Indian wrestlers on many of the poses, as well as offering evidence that Krishnamacharya was exposed to a European-style gymnastics curriculum during his time running the yoga shala at the Palace. Neither Sjoman nor Singleton finds evidence the Yoga Korunta exists, the ancient text that Krishnamacharya and Jois claimed as the source of the method that Jois called Ashtanga Yoga. If you look at videos of young Pattabhi Jois and B.K.S. Iyengar practicing the flowing style of yoga was developed by Krishnamacharya (available on YouTube), it's interesting to note how much asana practice has changed even in the past 60 years. Though Jois and Iyengar are undeniably masters of asana, their movements seem clunky, even awkward. There is none of the dancer-like grace that we have come to admire in more recent years. The evidence indicates the transformation of yoga asana from a handful of seated poses to the flowing dance from posture to posture to which we are accustomed has largely occurred in the past 200 years, gaining momentum in the past half-century, fixating on tradition seems misguided. Understanding change as an intrinsic part of yoga can allow us to loosen our attachment to the importance of history and observe how the practice continues to develop. Sjoman refers to this as a dynamic tradition, aptly capturing yoga's roots in the past and constantly evolving nature. Singleton, Mark. Personal correspondence, October 2012. Sjoman, N.E., The Yoga Tradition of The Mysore Palace. Abhinav Publications, New Delhi. First Edition 1996, Second Edition 1999.